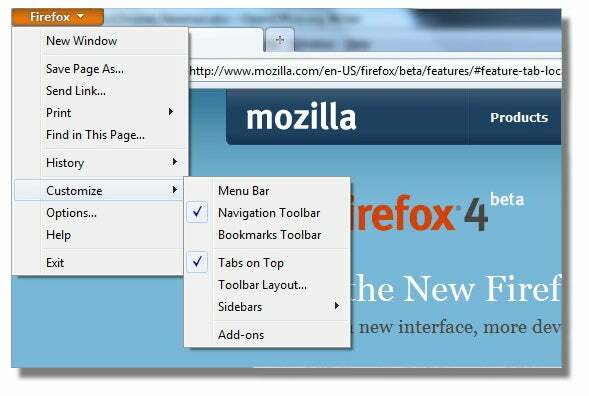 To put it politely, the Firefox 4 beta's new user interface is a sincere form of flattery. Chrome has an omnibar for URLs and search, but Firefox 4 has an omnimenu for almost every option that used to appear in its predecessor's dedicated menu bar. It has always bothered me that Chrome uses two menu buttons, one of which contains mostly useless functions such as copy and paste (seriously, who doesn't use keyboard shortcuts or Alt-click?). Firefox wins this battle by rolling everything into one button while banishing copy and paste. Like Chrome, Firefox 4 beta puts tabs on top of the navigation bar, but with one important distinction: Firefox's menu button remains above the tabs--which kind of defeats the purpose, since you still have to carefully align your mouse, the menu bar, and the browser to switch tabs. Chrome's tab positioning at the top of the browser lets you move the mouse all the way to the top of the screen--a subtle but highly practical difference when you're flying through the Internet. Bookmarks and bookmark options are missing from Firefox's new menu bar. That's because Mozilla moved them to a separate button that resides next to the search bar. There are enough actions and options associated with bookmarks to justify this move, and it's nice to have quick access without having to use a dedicated bookmarks bar as in Chrome. 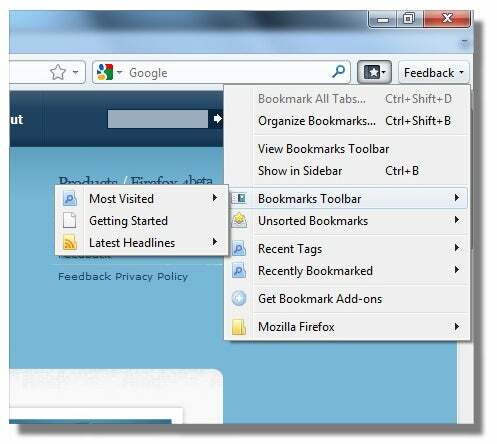 Firefox also provides an optional bookmarks bar, if you must. Firefox beats Chrome by six pixels with its default interface. Chrome is dragged down by its bookmarks bar, but Firefox could have extended its advantage if the menu button wwere better-positioned. Atop the browser, Firefox's menu button is flanked by nothing but wasted space until you hit the window buttons on the right side. Besides being something of an eyesore, it almost defeats the purpose of having a condensed menu bar in the first place (though I suppose that all of those options would look messy scattered across the page). Still, you can't argue with numbers, and Firefox 4 Beta is just roomier. I use Chrome for day-to-day browsing, but Firefox 4 beta has me considering a switch. The user interface, I think, is the most important part of any Web browser, and Firefox's looks cleaner and more modern than ever. Also, Firefox veterans strongly attached to the old interface can bring it back with a few menu options. It's frustrating that certain things that would be easy to improve--like the wasted space next to the menu button, and tabs that aren't really on top--aren't there yet, but this is a beta. I'm hoping Mozilla hasn't finished cleaning up its interface.